In a world that is all to often composed of the mass-produced and workplaces that fail to satisfy ones need for creativity, the Pilgrim Soul Forge offers the alternative! I offer traditional and fanciful metalwork at fair prices, with your satisfaction my aim. I most frequently work in the Craftsman and French-Deco styles, but I would love to make something for you that is a product of your vision. If you would like a new challenge, I also offer classes in basic and intermediate blacksmithing, bladesmithing, welded fabrication and welded sculpture. I hand forge knives and other tools to custiomer specifications. I enjoy recreating historic knives and other artifacts from the 18th and 19th centuries. I perform my own heat treating using both modern and primitive methods. Additionally, I hand-make the sheaths for my blades, using leather, wood or both! Modern Knives: A hand -forged 10" French Cook's Knife. I hand forge custom knives to customer specifications. TRADITIONAL KNIVES: From left to right, a Hudson Bay Camp Knife. This 19th century pattern knife features a hand forged 9" blade of 5160 steel, fiddleback Maple scales and pinned bolster. 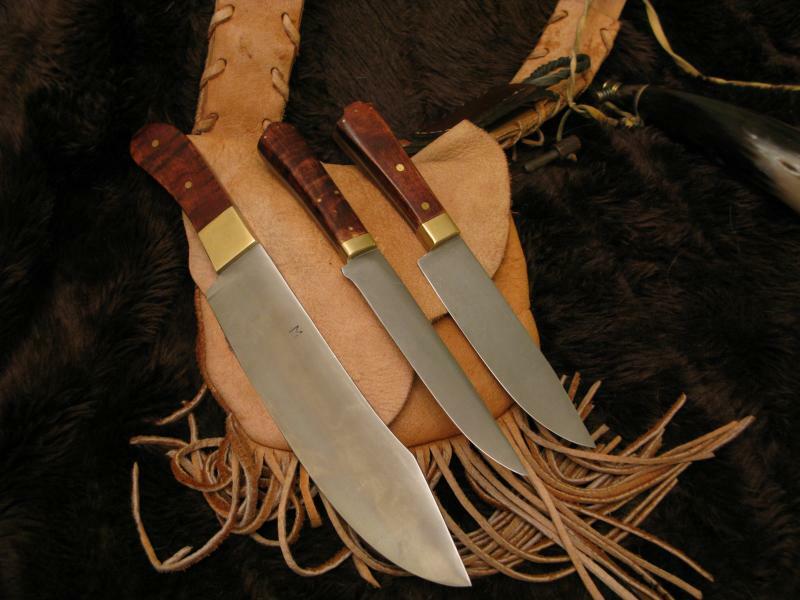 The center and right knives are 18th century "belt knives" featuring handforged 6" blades of O-1 tool steel, soild brass pinned bolsters and maple scales . 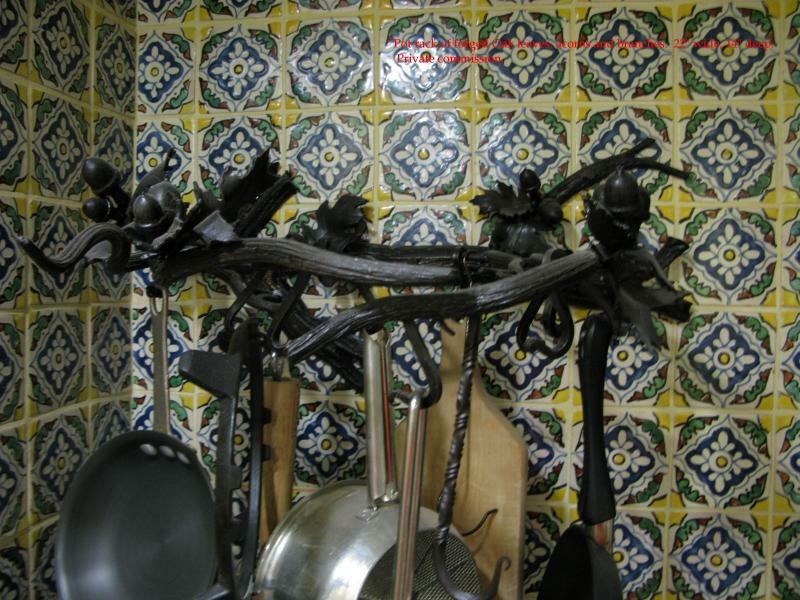 Above: A Pot-hanger forged in the form of oak branches, leaves and acorns. 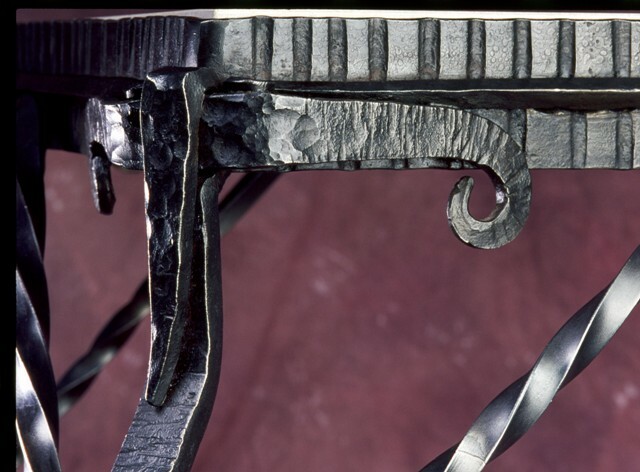 Below - Step-and-Wrap Joinery of an Art-Deco table leg.